1994 December Modern Drummer Photos of Chad dressed up in a suit, smoking… sorry no interview transcript yet. 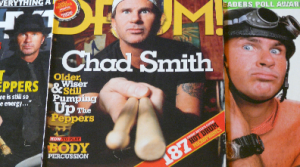 2004 July Rhythm (100) Chad Smith interview- lengthy interview with Chad talking about all sorts of things drumming, from working with the Chilis, his solo records to playing huge festivals, etc. Several full page photos. Chad Smith was also the guest editor in this issue. 2006 May Drum! (119) A long & detailed interview with Chad Smith; lots of info on his drum set-up, his playing on and the recording of, Stadium Arcadium. 2008 Summer Rhythm RHCP Chad Smith special! 2011 October Rhythm Interview with Chad Smith about the new line up of RHCP and the recording of I’m With You. Also interview with Chad’s drum tech Chris Warren about Chad’s new I’m With You transparent drum kit.